Caption: Winners Makana Pang and Gabriela Bryan hold their checks during the awards ceremony. HALEIWA, Oahu/Hawaii – (Sunday, April 1, 2018) — Kauai’s Gabriela Bryan (HAW) and North Shore’s Makana Pang (HAW) were victorious today at the Wahine Pipe Pro and Pipe Pro Juniorwith plenty of action and drama playing out in the picture-perfect split peaks of Pipeline. 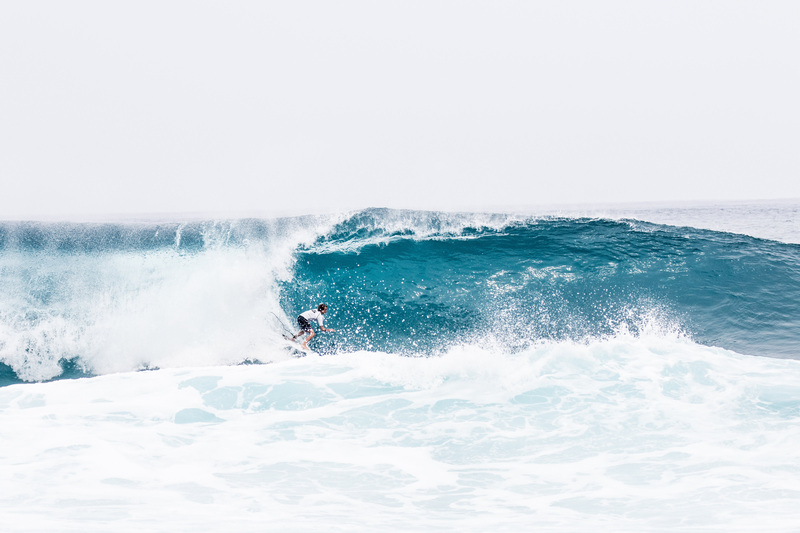 A World Surf League (WSL) women’s Qualifying Series (QS) 1,000 and a men’s Junior QS, the competition took place over two days during Easter weekend and saw pristine conditions at the world-famous break. This is Bryan’s third consecutive professional win for 2018 and she has steam-rolled to the top of the regional rankings in both the women’s Junior and QS divisions. Her breakout year began at the Sunset Pro Junior, strengthened in Tahiti two weeks ago during the Papara Pro Vahine Open, and reached new levels today at the Wahine Pipe Pro. Bryan, 15, took a commanding lead in the Final after she knifed into a set wave with commitment and drive on a Backdoor right. She combined the ride with power turns to open the heat, but Moana Jones (HAW) – who earned runner-up – was quick to drop into a nice left to highlight her backhand and jumped ahead with a 6.15. Sets lined up to provide excellent opportunities for the other two finalists, Savanna Stone (HAW)and Leila Riccobuano (HAW), but the best rides came from Bryan and Jones during the 30-minute heat. With five minutes on the clock, sets marched in and Bryan committed on a heavy wave that had beach goers holding their breath. After sticking a critically late drop, Bryan drove down the line and pulled into the barrel and despite it closing on her, judges awarded the wave a 7.0. Jones waited with priority after Bryan took the lead and needing only a 5.61 for the win, pulled into a Backdoor right and unleashed a series of maneuvers on her backhand. She earned a 5.55, just shy of the required score, and took runner-up. In the men’s Pipe Pro Junior, barrels pumped through the lineup and Pang opened up the exchange with an excellent 8.25 after blasting out of a classic Pipe barrel. 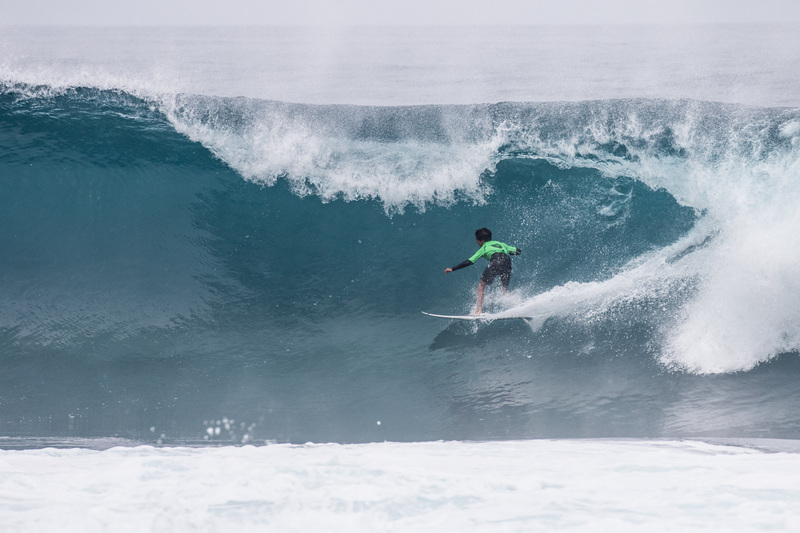 2017 Pipe Pro Junior winner and today’s eventual runner-up Barron Mamiya (HAW) answered back with his own excellent ride, an 8.40, after fighting his way out of a long right-handed tube to overtake Pang. Third place finisher Kainehe Hunt (HAW) scored a 6.90 on his first wave for a Backdoor wave, but the heat was a back-and-forth battle between Pang and Mamiya. “It was crazy, Barron’s definitely my best friend and always surfing out here,” said Pang. “Every time I paddle out here it’s with him.” Pang also mentioned that he draws inspiration from his friends, including Mamiya and other event standouts like Kalani Rivero (HAW), and Ryder Guest (HAW), and of course hometown hero and two-time World Champion John John Florence (HAW). Rapid-fire action kept fans on their toes throughout the men’s pro junior Semifinals as Hawaii’s best traded waves in the flawless conditions. Hunt and Mamiya took down Wyatt McHale (HAW), who had the regional junior lead heading into the event, while Pang and fourth-place finisher Malakai Martinez (CRI) also advanced into the Final after ousting reigning Junior World Champion Finn McGill (HAW). The opening ride of the Men’s first Quarterfinal was a perfect 10-point ride by Mamiya, for a proper 10ft., under-the-lip airdrop into a Backdoor barrel. His fierce attack set him apart from competitors as he demonstrated a world-class performance that many touted as Championship Tour (CT) level surfing. Eli Hanneman (HAW), 15, earned the day’s second perfect 10-point ride after threading three sections through a draining Backdoor tube and advanced behind Mamiya, but was eventually knocked out of the competition in the Semifinals. In Quarterfinal 2 of the Wahine Pipe Pro, standout Keala Tomoda-Bannert (HAW) paddled into the best wave of the women’s event, a 9.0 on her backhand, to validate the talent and commitment from Hawaii’s up-and-coming wahine. With confidence and poise, the Kauai surfer dropped cleanly into a left-handed Pipe barrel and emerged with the spit to complete the ride and take the heat win. However, after charging a solid 8-foot Backdoor wave later in the heat, Tomoda-Bannert collided with the reef and suffered a head injury that saw her transported to a nearby hospital. She was unable to claim her place in the Semifinals and returned home to rest and recover. The Kauai athlete ended with a seventh-place finish today following a runner-up result to Bryan two weeks ago in Tahiti at the Papara Pro Vahine Open. This concludes the 2017/’18 competitive surf season for the WSL Hawaii/Tahiti Nui region and athletes will reconvene in October for a series of events once the North Shore reawakens from a summertime wave lull. In the meantime, regional surfers will travel to international locations to gain points and prize money on the QS, and fans can stay tuned to WorldSurfLeague.com to witness elite-level athleticism as CT surfers hunt for a World Title. Surfers listed in order of 1st through 4th, all surfers from Hawaii unless otherwise noted. The rights to any Content attached or accessed by link within this email are granted by the Association of Surfing Professionals LLC (“World Surf League”) to you (the email recipient) and any entity you represent pursuant to the terms and conditions below (“Content License”). By opening or accessing the Content, you accept the terms of this Content License. The rights to the Content (or any part of it) are royalty-free and granted for editorial use or news service use only and this Content License will expire two (2) weeks from the date of this email. No rights for sale or for commercial use or modification of the Content are granted in any way, including any right to associate the Content or any subject or brand with a commercial brand or message. Rights to individuals within the Content are not provided. Where the Content is used in any way on digital platforms, a link to www.worldsurfleague.com must exist where the Content is visible. Where the Content is used in any way on social media, a link to @wsl must exist where the Content is visible. The Content is provided, on an “as is” basis and no warranty is provided for its use by you. World Surf League owns all rights, including copyright to the Content. ALL RIGHTS NOT SPECIFICALLY PROVIDED ABOVE ARE RESERVED BY WORLD SURF LEAGUE.